This past weekend we had the opportunity to take our first mini vacation as a family of four. The destination: The National Harbor - a shopping, dining, and resort oasis just outside of DC in Oxon Hill, MD. I was invited by Tanger Outlets National Harbor to “Shop & Stay," shop Tanger Outlets and stay at the Gaylord National. 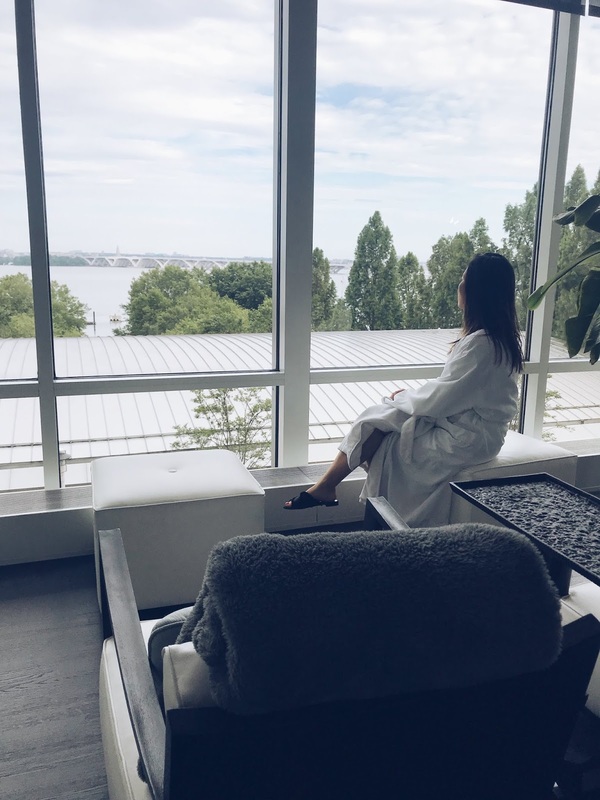 Tanger Outlets let me in on the many ways to save money on their wide array of designer brands, and the Gaylord National treated me to some of their new salon services at Relache Spa. 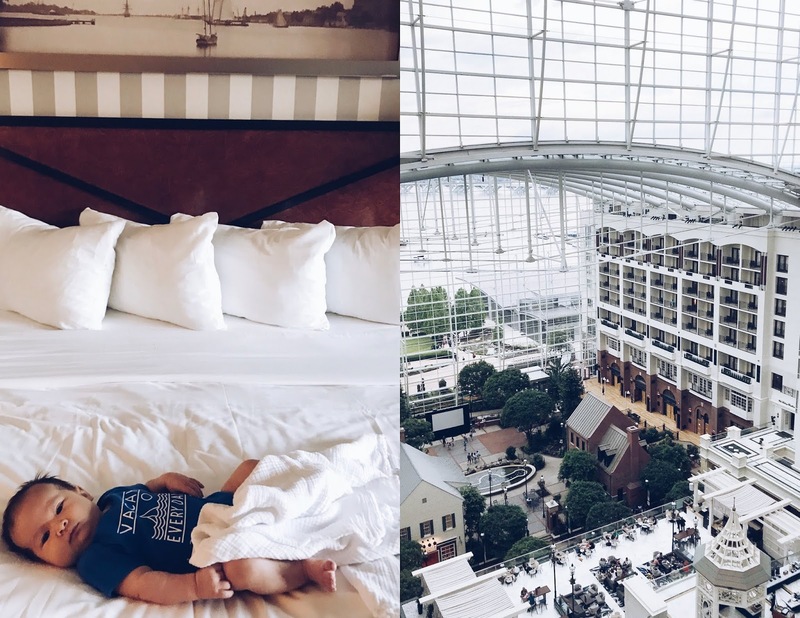 Keep reading to learn more and get some tips on traveling to The National Harbor with a family. 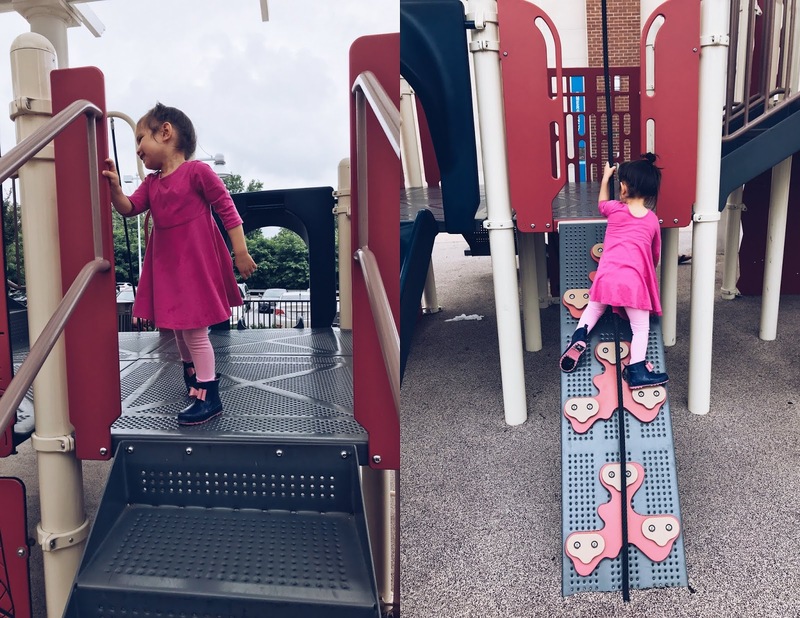 For Families: Since both my husband and 3 year old daughter, Blair, have a low threshold for shopping, they spent some time at Tanger's Children’s Play Area while my son napped in his stroller. I took a few shopping breaks to go nurse him and loved seeing that Tanger provides private nursing areas on site. After shopping we checked-in to our room at the Gaylord National. Our room included a comfy king size bed and a balcony overlooking the hotel atrium with a view of the Potomac River in the distance. The room provided plenty of space to set up our travel bassinet for my son. We've been lacking sleep lately as my newborn son, Brantley, is still waking up several times at night to nurse. I was feeling pretty anxious about how and if any of us would get sleep staying together in the same room, but I’m happy to report that by 8pm everyone was sound asleep (everyone but me). Brantley had a nice first stretch of sleep and then woke up a few times in the early morning to nurse. My biggest concern was that Blair, my champion sleeper, wouldn’t get any rest, but she slept well. I woke up a few times to find her sprawled out on the bed - head on my chest, hands stretched out onto my face, and feet on my husband. She later told us she loves sleeping at hotels. 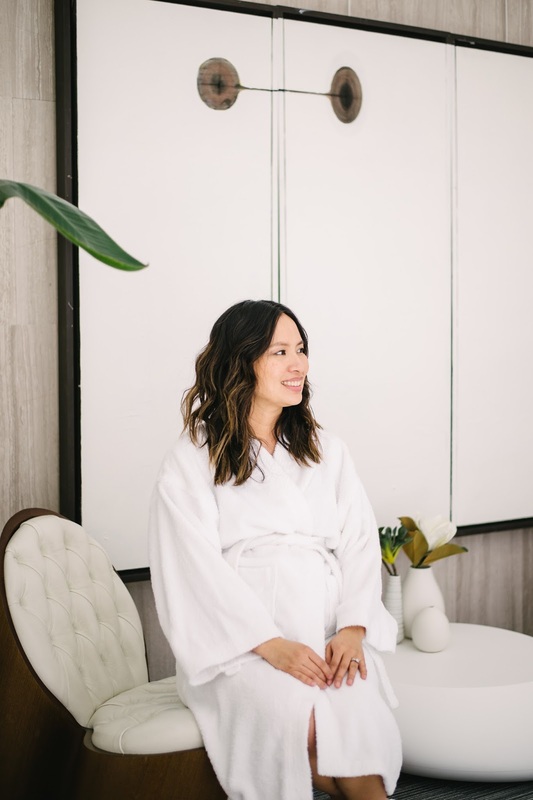 In the morning, I slipped away to Relache Spa for some me-time and to try out their new express services - beauty treatments designed for their guests who don’t have a lot of time to spare but still want to squeeze in some self-care and pampering. Perfect for this Mom traveling with her family. All services take 25 min or less and cost $65 or less. I got to try out the LED eye treatment, eye and lip treatments, the express facial, how to brow, hand massage, and blowout. The express facial only took 15 minutes, and I saw immediate results. My skin felt rejuvenated, firmer, and glowed for the rest of the day. Currently, the Express Bar services are only available for walk-in appointments. 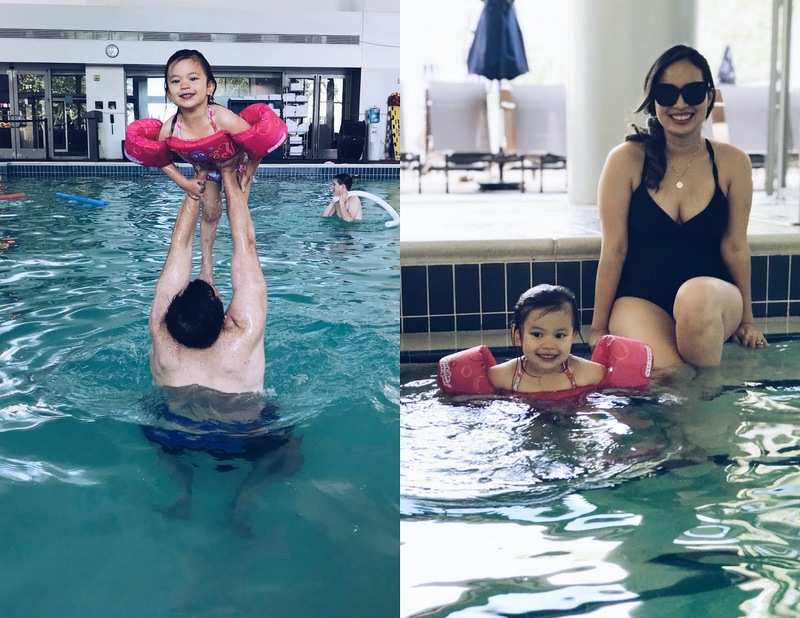 For Families: Feeling refreshed, I met back up with my family to take the kids to the huge, heated, indoor pool and the outdoor splash pad. Again, Brantley napped in his stroller while Blair had the time of her life. After showering and packing up the car (thank you Gaylord for the late checkout! ), we walked down to the National Harbor to ride The Capital Wheel. On the way, we stopped to play in the beachy sand by The Awakening sculpture. Blair was nervous and SO excited to ride The Capital Wheel. I’m mildly afraid of heights myself and was also nervous, but The Capital Wheel is unlike any other ferris wheel I’ve been on. It's completely enclosed, air conditioned, and plays music. I loved watching Blair point out all the things she recognized from inside the gondola. We could even see the Washington Monument in the distance. For Families: We parked our stroller at the bottom in the stroller parking area and took Brantley inside the gondola in his car seat carrier. 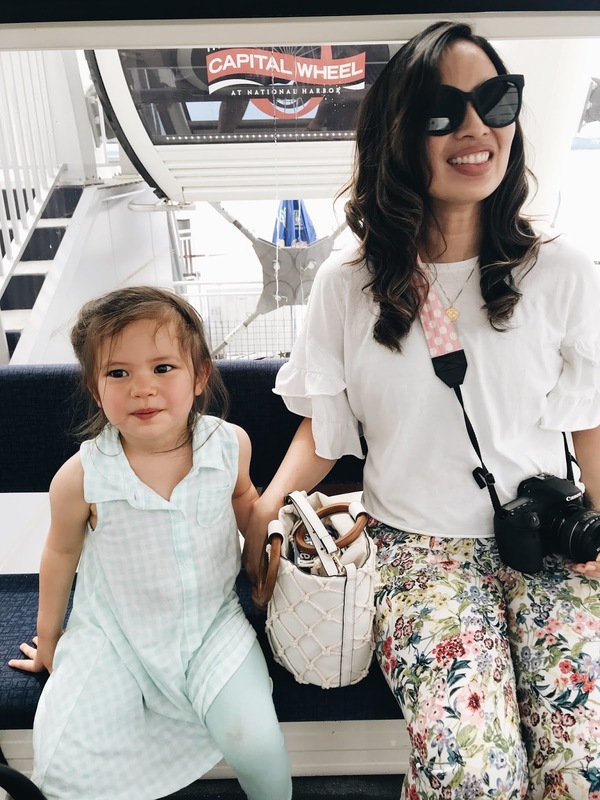 Taking a vacation close to home (aka staycation) is a good way to practice traveling with kids. If you forget something major (we didn’t) or the kids completely freak out (they didn’t), you’re close enough to home to remedy the situation. In the future, we'll make sure our hotel room has two beds so Blair can have her own, and we can sleep without limbs in our face, or even better, book a suite or adjoining rooms so my husband and I can spend some time together without fear of waking the kids. It was such a fun little trip, and I’m already thinking about my next visit to the The National Harbor. Next time, we want to ride the Carousel and pedal boats and check out Tanger's deals on kids clothes. Have you ever been to The National Harbor? What's your favorite thing to do there? Thank you to Tanger Outlets National Harbor and the Gaylord National for hosting us and partnering with me on this post. A really big thank you to Tanger Outlets National Harbor for being so kind to my family and making special accommodations for them. As always all opinions are my own. 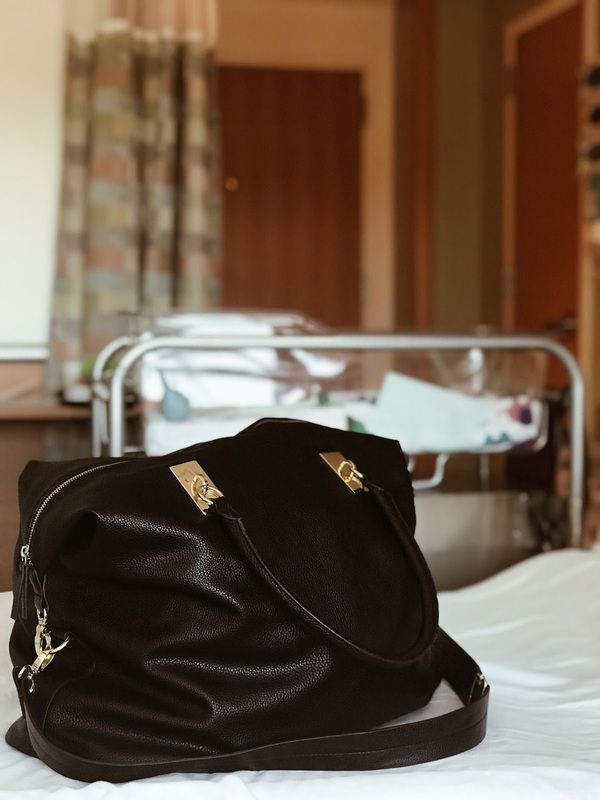 After feeling like I packed way too much stuff for the birth of my first child, I took a more minimalist approach to my hospital bag this time around. I kept most of my daughter's baby stuff with thoughts that we might have another child. Now that those thoughts have come to fruition, it's been a relief to not have to worry about investing in too many new things. There are many benefits to continuing to exercise and to staying active while pregnant for you and your baby (read here). For me, I'm motivated by the added energy it gives me and how much better I feel overall when I do it. Though, I'll readily admit it's not easy - especially while trying to keep up with a 2-year-old. With my first pregnancy, my schedule was much more flexible, and I was free to workout whenever I wanted. I went to pilates, barre, and yoga classes, and also to the gym regularly for light weight training and cardio. With my second pregnancy, I've had to look for alternatives that work with my limited time schedule. Make sure to consult your physician before doing any exercises and most importantly, always listen to your body. It takes some coordinating with my husband, but I try to make it to an in-person prenatal yoga class at least twice a week. Going to a studio gives me access to all their props - blankets, blocks, bolsters, and an instructor who can show the correct pregnancy form and what moves to avoid. It's a great place to meet other pregnant women and start building your mom squad. Going to the in-person classes also helps me feel more confident about doing online yoga videos at home. For online yoga, I really like Sara Beth's prenatal yoga series on Youtube. All the free classes are about 20 min or less, and I can usually manage to fit one into my day. I also got myself a set of yoga blocks from Marshalls for $10, and find that they're critical on days I'm feeling a little tighter. Three times a week I do exercises from Alexa Jean Fitness' Fit Pregnancy Guide. I first found Alexa Jean on Instagram and used a few of her 30-day workouts to help me get back into shape after my first pregnancy. For pregnancy workouts, she's created a guide for each trimester. I purchased the bundle of all three trimesters and love that each daily workout consists of only 4 exercises that you repeat 4 times. It's quick way for me to get a little bit of strength training in. My friend, Kathy, introduced me to a local stroller workout group called S.L.A.M (SWEAT LIKE A MOTHER). They're a part of Stroller Strong Moms and are unlike any group I've worked out with. It's one of the best and continually challenging workouts I've ever done. Honestly, due to weather and location changes, I haven't been to a class in a while but did go a little in my first and second trimester. The best parts of S.L.A.M are that you can bring your kid(s) with you and that you're surrounded by other moms who understand if you're late, if your kid is fussing, if you're struggling, etc. The instructors are also moms (some were even pregnant while teaching) and are incredibly kind and motivating. It's a great supportive group of women. I'm looking forward to working out with them again soon. If there's one item of maternity clothing I'd recommend buying it's maternity workout leggings. Personally, I prefer the ones that have a band that goes over the belly. It helps the leggings stay up, and I think they're just more comfortable. I have one pair that sits below my belly and there are certain times and moves where I feel like the waist band digs into me. Also, find a top that's long enough to cover your bump so you're not constantly adjusting yourself or worrying about baring your belly. Thank you to PinkBlush for sponsoring my leggings and top. I hope I've helped motivate you to stay active while pregnant. I truly believe in the benefits for you and your baby. Do you have any other recommendations on things that have worked for you? Please share, I'd love to try them!